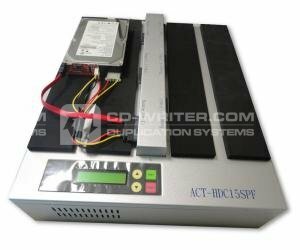 The StorDigital HD Clone Station (SDHDCS-5) is a fully standalone hard drive duplicator that creates up-to 5 perfect clones simultaneously. The HD Clone Station can also securely erase data from multiple target drives using the USA’s Department of Defense 5220.22-M sanitisation recommendation. This allows companies disposing of their legacy hardware to quickly and efficiently secure their data proir to disposal. StorDigital The HD Clone Station supports standard 2.5” and 3.5” internal Sata drives, SSD as well as PATA/IDE drives by way of an optional converter, sold separately. HD Clone Station it totally standalone and requires no host PC or software for operation. It can be used anytime and anywhere without intensive training. The easy to use LCD interface allows for easy and fast operation of the simple clone function. The device also features a host of more advanced functions including, Compare, Quick Compare, PreScan and more. Hard . Drive . Duplicator . Clone . Station . 5 . StorDigital .